The office drop a Cisco Aironet 1130ag as they upgraded to a newer release and I was able to get hold of it. I am still trying to learn more about Cisco and hope to have my CCNA in a few months and I tested this new toy with great success.. I use an Ubuntu box as my desktop connected to the "home" wireless network. This desktop has a nic connected to a small 100Mbits switch on a "private" network. To this switch I connected a small Cisco 805 (also discarded away by my company) that I use to play with "cisco" and as DHCP server. Also connected to the switch I have a Winblowz desktop to run those win32 applications I cannot get rid off and I connected the Cisco Aironet 1130AG to it. The Ubuntu desktop is my gateway to the "home wireless network". I know I could use the Ubuntu box also as DHCP but .... I wanted to play with Cisco and once that was working (quite easy by the way). I never removed it. Now.. the plan was to have my private wireless network away from my "flatmates" that I could use with my laptop. 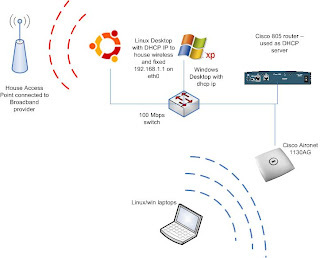 At the same time I wanted to surf the net so using the existing configuration would allowed me connect to the "private wireless network" by the Aironet, use the Ubuntu box as gateway (as I do from the windoze box) and jump to the "house wireless network" to get into the internet. All this was quite easy. Old post on this site shows how to configure the Ubuntu box as gateway and how to configure the Cisco 805 as DHCP server and now will write down the configuration of the Cisco Aironet 1130AG I used (that I got from this site). a) connected a console cable to the Aironet and to your pc serial port. I used the ubuntu box and minicom. b) connected the aironet to the switch using a straight through cable. c) powered on the aironet and log in with privileged mode. It seems the default password is "Cisco". The aironet has 2 anthenas Dot11Radio1 and Dot11Radio0 for 802.11a/b/g and they are bridged to fastehternet0 therefore the ip given by the DHCP server is also the same for the wireless interfaces. As you can see that was it.. quite simple but I guess once I get on with my CCNA and start knowing more about Cisco config I will be able to do more interesting stuff... (radius authentification for example). This was as good thing to play with and I am sure I will be able to use the Aironet wireless in a best example in the future as right now is just to play around.